It is Wednesday, the midpoint of the work/school week. You know how some weeks go by really fast and other weeks go by really slow. This is a slow week at our house. I woke up thinking it was more like a Friday to only realize moments later, it is actually only Wednesday. I’m not sure why this week is so slow. Maybe I am excited for a little Girls Time this weekend, or maybe I am still adjusting to the school schedule; whatever it is it needs to move along a little quicker. However, there is nothing better than a little cake to cure a slow week. 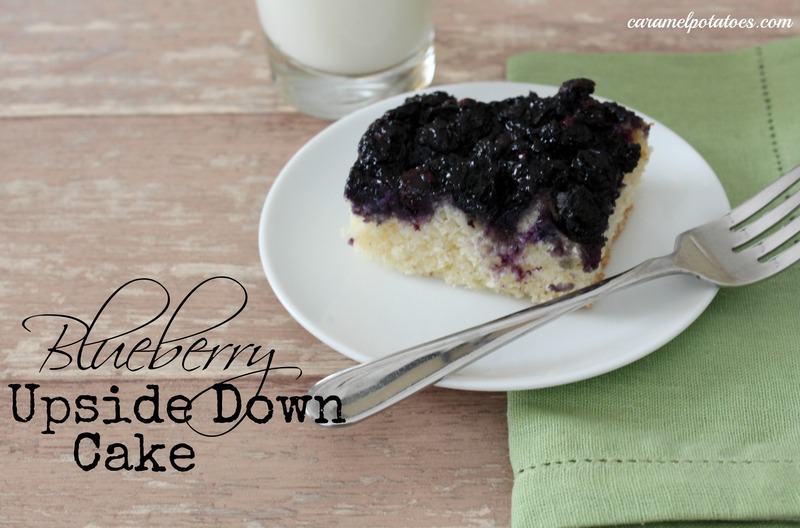 This Upside Down Blueberry Cake is a easy recipe that takes only a few minutes to put together. And whether you want to eat it for breakfast or dessert is up to you. In a small saucepan, melt 2 tablespoons butter; stir in brown sugar. Spread into a greased 8-inch baking dish. Arrange blueberries in a single layer over brown sugar mixture; set aside. In a large mixing bowl, cream remaining butter; beat in sugar. Add egg and vanilla; mix well. Combine flour and baking powder; add to creamed mixture alternately with milk. Carefully pour over blueberries. Bake at 350 for 35-4o minutes or until a toothpick inserted near the center of cake comes out clean. Immediately invert onto a serving platter. Cool. Serve with whipped cream if desired. I made this last night for breakfast dinner and it was amazing!! I subbed in a gluten-free all purpose flour since we have a wheat allergy in our house. Great flavor! Oh yum. I need to try this.